To empower young people by fostering a life-long love of sailing, as well as respect or others and the marine environment. Our program will provide a solid foundation in the knowledge and arts of seamanship, build confidence, self reliance and a sense of achievement through the mastery of skills, and by stimulating an appreciation for the merits of hard work, dedication and teamwork, promote the Corinthian spirit in competition. 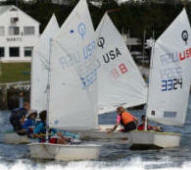 Founded in 2003, the North East River Yacht Club (NERYC) Junior Sailing Program has developed from a limited and informal summer activity for member children to the expanded program that it is today. It features a summer 'learn to sail' camp, coaching clinics, junior sailing regattas, travel team racing opportunities and a variety of junior friendly club events. 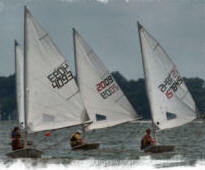 The club's small boat fleet includes Lasers, Optimists, Sunfish and Club 420's. Juniors also have great opportunities to broaden their skills when they participate as crew at club keelboat race events. The Junior Sailing Program aims to provide a quality, fun and educational program for youth interested in sailing and racing, by providing students with the opportunity and fundamental skills necessary to stimulate their interests and support their development in the sport of sailing. Consider joining the club so your junior sailors can enjoy the many benefits of membership: discounted program fees, club regattas, travel team racing, use of club boats, annual awards and participation in club events. Visit us NERYC Junior Sail on Facebook to view photos, news and updates and ‘Like’ us to include our updates on your newsfeed.